The EFAF Annual General Assembly will be held at Paris from March 26-28, 2004. The hotel reservation forms has been send out today by EFAF office to all member federations. Dear all, with this e-mail EFAF invites all EFAF officials to attend the 2004 EFAF Officiating Clinic. All the information on the clinic can easily be found at the web site: http://clinic2004.ajek.org The clinic facilities are in Hotel Rivoli Järvenpää (in the city of Järvenpää). SAJL- Finland held its annual general assembly in Seinäjoki. Assembly chose federation president Mr ROOPE NORONEN to continue in his post for 2004. Noronen has now served with the SAJL from 1999 as he was first vice-president in 1999-2000 and then president from 2001. As the result of the annual EFAF Club team Meeting, this year on weekend November 8./9. 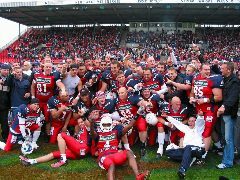 in Copenhagen, the 2004 tournament divisions and groups of Eurobowl and EFAF Cup were fixed. The meeting of the club representativs of nearly all 20 clubs present was constructive and productiv. 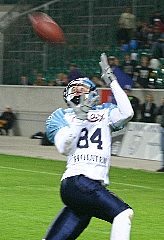 Exciting NFLEL action like this is heading to Cologne in 2004. The German city of Cologne (Köln) has been awarded an NFL Europe League team, it was announced today. The Cologne team, which has yet to be named, will play its home games at the 50,000-capacity RheinEnergieStadion. The annual EFAF club team meeting for teams, participating in EFL, Eurobowl or EFAF Cup 2004, takes place in Copenhagen, Denmark, this year. Venue is the Scandic Hotel Copenhagen, Vester Sögade, in the centre of the city. Contact EFAF or Danish Federation DAFF in case of interest. The NFL Europe League has suspended operations of the Barcelona Dragons, NFL Europe Managing Director Jim Connelly announced today. The team has experienced declining attendance in each of the past five seasons, including a five-game average of 6,868 in 2003, the lowest in the league. Enclosed you´ll find an overview about the most important game dates, the time frame qualification or group games have to be played and the fixed weekends for TOP 12 games and semifinals and finals. Please notice that the Eurobowl Final 2004 is played one week later than usual - and already pusblished - on weekend July 10./11.2004. Hamburg Blue Devils win the German Bowl again. It was a close game between the Hamburg Blue Devils and the Eurobowl Champion Braunschweig Lions. 30:30 was the result after the regular gametime in front of more than 20.000 spectators at the Volkswagen Arena at Wolfsburg. Braunschweig scores first during Overtime, but missed the Extrapoint. Next weekend there will be the revanche game for the last senior championships in Germany. Again the defending champion Hamburg meets the vice-champion Braunschweig. This year the game is played in the new Volkswagen-Arena in Wolfsburg after the finals 2001 in Hannover and 2002 in Braunschweig, organized again by the Braunschweig Lions promotor. A new club generation dominating swedish American Football? European Youth coach of the year.